30 Second Wine Advisor: Organic, but what variety? National magazines recommend The California Wine Club! The California Wine Club has been recommended by respected national magazines! Join the Vibrant Rioja Community for a chance to win a case of wine or a trip to Rioja, Spain. As I've observed before, I respect organic wines, mostly, because the effort required in growing grapes and making wine under increasingly strict organic regulations signals a commitment to quality on the winemaker's part. However, "organic" on the label doesn't necessarily make the sale for me, as I'm not convinced that you can taste the organic difference in your glass, and most of the artisanal producers I admire, organic or otherwise, generally tend to farm grapes and squeeze the fruit with considerable respect. That said, I won't turn down a well-made organic wine (or "wine made from organically farmed grapes" - for the details, check my update on recent U.S. regulatory changes in the July 24, 2009 Wine Advisor). 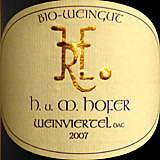 Today's featured wine, however, goes a step further: Weingut H.u.M. Hofer, a smallish producer in Austria's Weinviertel ("Wine Quarter") just north of metro Vienna, features its organic status ("Bio-Weingut") atop the front label, but requires a close inspection of the back label to reveal the grape variety, Austria's signature Grüner Veltliner. Hofer, a Certified Organic wine estate, belongs to a group called Bio-Ernte which holds its members to organic standards higher the European Union guidelines for organic labeling. Grüner or organic? Which to promote? It seems that Hofer's priorities are clear. The wine, in any case, speaks for itself: It's a good-quality "GV," fresh and crisp, with the "stony" minerality and white-pepper nuances that characterize the grape. FOOD MATCH: Like most GV, this makes a versatile match with a range of fare. It went well with cheese and veggie pizzas on the first night; pan-seared, oven-roasted natural pork chops with sage a few nights later. With more than half the bottle remaining, under screwcap and refrigerated, it showed no perceptible deterioration over a four-day period. Look for vendors and compare prices for Hofer's Grüner Veltliners on Wine-Searcher.com. The California Wine Club has been recommended by these national magazines: Redbook, Food & Wine, Bon Appetit, Pink, Robb Report, Inc. and Parade! People everywhere are cheering about The California Wine Club! Club owners Bruce and Pam Boring travel throughout California in search of small family-owned wineries handcrafting award-winning wines made in such limited supply they can't be found in local stores. This process of hand-selecting the very best wines for their members is what has caught the attention of magazines nationwide. Each month features a new winery and a new adventure! Gifts start at $34.95 plus shipping and you may send as many months as you wish. Every wine featured comes from a real-working winery and backed by the club's 100% guarantee. Monthly deliveries also include the club's 12 page, full color newsletter, Uncorked! Save with discounts on 3, 6, 9 and 12 months. Send a fun and unique gift this holiday season and give a gift that will make people cheer. Visit www.cawineclub.com or call 1-800-777-4443. How would you like to discover the land of a thousand wines? How about uncovering the heart and soul of one of the world's greatest wine regions? Vibrant Rioja is giving you the chance to win the experience of a lifetime - a trip to Rioja, Spain, and all you have to do is join the Vibrant Rioja Community. Oh! and you'll receive our newsletters, which will keep you informed of our tastings, events, delicious recipes, tasting notes and much, much more! Just click here to get started: Vibrant Rioja! And if you're in the wine trade, you can join the Vibrant Rioja Trade Community! You will also have the chance to win a trip to Rioja as well as receive invitations to seminars and tastings, Rioja images and POS, newsletters that are aimed at helping you build your business, merchandising materials and much more! Just click here to get started. In the meantime, visit VibrantRioja.com and learn more about Rioja, its grapes, climate, terroir, architecture culture, gastronomy and more! Remember, the trip of a lifetime is only a click away! Salud! Vibrant Rioja!